One Mellow Monk fan tells us she likes putting leaves from her lemon verbena bush into her green tea. 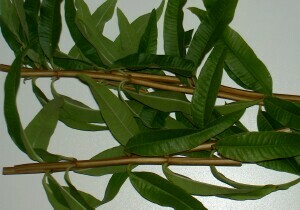 A picture of the leaves is shown below. We decided to try it ourselves. We got a few verbena leaves from an acquaintance who also had a verbena bush, gave the leaves a quick rinse under the faucet and plopped them into a pot of Mellow Monk tea. We liked it! It gives the tea a very subtle hint of lemon, but isn't too lemony at all. Of course, Mellow Monk tea has a full-bodied flavor that can stand on its own, but every once in a while, a change of pace is nice. Variety is the spice of life, after all. If you have any suggestions about nice things to add to green tea, please drop us a line and let us know. Every once in a while, it's nice to brew a strong, dark cup of green tea to really wake up your taste buds and enjoy the full, hearty aroma. You can let the tea steep longer or use more tea leaves in the pot ... or both. The ability to produce a strong, deep infusion is also what separates quality teas like Mellow Monk from other teas. A strong cup of green tea is a nice change of pace, and a great way to start your morning (especially a Monday morning!). Here is an article about a study conducted at a British university that showed that drinking green tea may help prevent Alzheimer's disease. Specifically, the tea may inhibit certain brain enzymes that are linked to the disease. The study looked at the effects of black tea, green tea, and coffee on three chemicals known to play a role in Alzheimers. Coffee did not show any effects, and black tea worked against two of the chemicals, but only green tea was found to inhibit all three. One of our customers writes in to say she enjoys her Mellow Monk green tea with just a little bit of honey. There are many things you can add to your green tea for a change of pace--cinnamon, vanilla, even organge peel. If you have a special combination of goodies that you like to add to your green tea as a change of pace, please drop us a line and let us know. This article discusses a report in the recent issue of Mayo Clinic Women's HealthSource about studies showing that a component in green tea kills leukemia cells in the laboratory. The research was conducted at the Mayo Clinic and focused on a compound known as epigallocatechin-3-gallate, one of a class of compounds found in green tea called catechins. For an overview of the health benefits of green tea, see our page "Tea and Health". Here's an old-fashioned Japanese candy that goes great with green tea. It’s called Botan Rice Candy. It’s soft and chewy, and not too sweet. It’s been around for ages in Japan, where a lot of young people today might not even know about it unless they went into a small, traditional candy store in the old part of town. 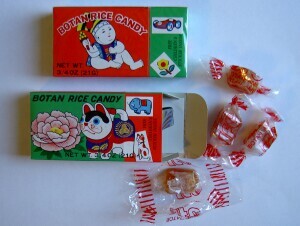 A picture of Botan Rice Candy is shown below. What makes this candy unique is the edible inner wrapper, which is made out of rice paper, and it dissolves in your mouth. It’s not just a gimmick: it serves the practical purpose of keeping the sticky mochi-like candy from sticking to the outer wrapper. But many a first-timer has spent an agonizing time trying to pick off the delicate edible wrapper shred by tiny shred, only to find out later that it’s edible. But remember: it’s the clear inner wrapper that’s edible, not the waxed-paper outer wrapper! If you would like to see Mellow Monk carry food items like this, please drop us a line and let us know. Surnames for us common folk are relatively new in human history. Until a few hundred years ago, only the ruling class had them. Everyone else had only first names and were distinguished from their same-named compatriots by their fathers (Eric, son of Davis) or where they lived (William of Langley). These identifiers are also what eventually evolved into many of today’s English surnames. Many other surnames come from occupations: smith, baker, butcher. In Japan, surnames are depicted with kanji, or Chinese ideograms. Most surnames indicate a place, as you can see in the most common ones: Tanaka (“middle of the paddy”), Fujita (“wisteria paddy” [as in a rice paddy next to trees covered in wisteria vines]), Hashimoto (“base of [or under] the bridge”), Yoshino (“lucky field”), Matsui (“pine well,” as in a water well amid pine trees), and Suzuki (bell tree, or belled tree). Most last names are written with two kanji, but some are depicted with only one kanji, others with three or even more. The reason that last names come first in Japan has to do with the Japanese language: Hundreds of years ago, someone today known as Fujita Hiroshi would have been known as “Fujita no Hiroshi,” which can mean “Hiroshi of the Fujita [family or clan].” But because they most often refer to a place, surnames could have gotten their start as geographic reference points. In other words, in Hiroshi’s place, “Fujita no Hiroshi” could have meant “the Hiroshi who lives by [or owns] the wisteria paddy.” Just as appellations like “John the Smith” became simply “John Smith,” the “no” eventually disappeared from Japanese names, too. It could also be that way back in feudal Japan, the last name of a peasant, merchant, or other commoner came from that of the wealthy landowner on whose land he lived or whose land he farmed. Even so, that such a large percentage of Japanese names are place names suggests that the land-owning class was just following an already-established practice when they became the first people to give themselves last names. Or, to look at it another way, the fact that the aristocrats were the ones who got surnames first explains why there are almost none that suggest hard work! It’s interesting how both cultures in those days turned to the languages of classical cultures to create new words. Today, acronyms seem to be the default method in the English-speaking world for naming new concepts or inventions: PDA, ADD, CEO, HMO. However, we still sometimes go back to Latin and ancient Greek to form new words: biotech, ergonomics. Similarly, the Japanese still turn to kanji: ekishou (liquid crystal), kyougyuubyou (mad cow disease). Are human beings basically good or evil? We believe that the answer to this question is: potentially both. On the one hand, most people are basically good to their children, parents, siblings, friends, colleagues, neighbors. They’re even good to the people they know only casually, such as waiters and waitresses in their favorite restaurants, people in their vanpool, someone they chat with on the train every morning on the way to work, and others in their general community. In other words, most people are basically good to the people around them, the people they deal with directly. The problem, however, is how people regard those outside their community: how one city regards another. How one state treats another. How one nation treats another. We admit that the history of humankind can be seen as one of wars of conquest, but consider all the good that people of capable of towards those around them: the selflessness of most parents, the many grown children who care for aging parents, the friend who helps more than any relative. The doctors and nurses who are dedicated to caring for their parents. The many volunteers who do so much, especially in this country. A lot of “good” is being done, and that potential for good can---not always, but often---be extended to a wider and wider circle beyond our own community, however we define that. In our dealings with those around us, in a way it’s just common sense to be good, because you never know when you may need their help. We share common interests. Which explains why larger groups can be in conflict: conflicting interests. But given the increasingly global scale of some of the problems we face today---problems that no single nation can tackle alone---it’s starting to make more and more sense to work together for the same common-sense reason that two neighbors treat each other in a neighborly way. No, this is not a paid endorsement for Netflix, the online DVD rental outfit. But we at Mellow Monk are hooked on the mellowness-enhancing convenience of Netflix and want to see this young company survive and thrive so that we can all continue to enjoy it. If you’re not familiar with the Netflix system, here’s how it works: You sign up online and create a “queue” of movies you want to see. And Netflix has just about every movie released on DVD, including old movies, foreign films, and documentaries. Everything. As soon as your account is activated, Netflix sends you whatever movies are first in the queue. They come in the mail in a mailer that includes a postage-paid return mailer. When you’re done watching the DVD, you place it in the return mailer and drop it in the nearest mailbox. Once Netflix receives the DVD, it sends you the next movie in your queue. The subscription fee is a flat monthly fee. There are different plans that vary in price depending on how many DVDs you want to have “checked out” at the same time. On the three-at-a-time plan, you can have up to three DVDs out at a time. If you have three out and return two, you get the next two in your queue sent to you. Return all three, and you get three more. Netfix has definitely reduced the stress in a lot of people’s lives by eliminating the need to go to the video store to rent or return movies--and by eliminating outrage at the sometimes questionable late fees. If you check the corporate annual report of some of the big movie-rental chains, you’ll see that those late fees account for a significant portion of their revenues. At Netflix, the flat fee means that the more movies you watch, the more value you get for your money. We like that system and the philosophy behind it. While we're not trying to make the Mellow Monk blog into the Oprah show, we came across a heartwarming story that we just couldn't resist passing along. During World War II, when the Army was segregated, a white soldier named Everett Hines was pulled from the burning wreckage of a B-17 bomber by Abe Watson, a black serviceman near the crash site. Hines would surely have burned to death had not his rescuer acted so quickly. Both men were burned but recovered. Hines thanked Watson for saving his life during a brief meeting they had while recovering, then they went their separate ways. Both survived the war but didn't meet again until the early 1990s, when Hines was visiting a friend in the hospital and saw a man being wheeled by on a gurney -- it was Watson. He had suffered a heart attack and died the next day, but not before Watson asked his long-lost friend to look after his daughter, a single mother with three small children. Watson, who was living alone after having been widowed a few years earlier, immediately agreed. "How could I say no to this man?" he said. Watson's daughter and three children moved in with Hines, who for the past 14 years has been father and grandfather to the now-teenaged kids. This story is positive on so many levels... the amazing coincidence of the two men's reunion, his agreeing to be an adoptive grandfather. Having the chance to return one favor with another so many years later. This sounds like a dangerous thing to do, but let us explain. In an interview, a successful businessman described an epiphany he had after years of ruthlessly advancing his own career by destroying the careers of others. He had been raised in a very competitive environment and was taught that the opportunities out there must be seized aggressively, or someone else will. In a sense that's true, but he took this philosophy to the extreme, ruining the careers of others not only to advance his own, but eventually because of the pleasure it gave him. But deep down he was not happy. He did not know why, but he was unhappy and angry, and he took out his anger on his wife and children and everyone else around him. Then one day a friend gave him a drawing of a tiger dozing lazily on the ground. He told him that most people are like sleeping tigers -- possessing so much raw strength and talent but not using it. The businessman pondered that thought and eventually realized that the key to success in business (and life) lies not in crushing others, but by awakening their talents, getting them to realize their full potential by drawing on their intelligence, drive, and creativity. These “sleeping tigers” are not just a CEO’s underlings; they are everyone around us -- our children, spouses, friends, colleagues, even parents. Everyone. Have you awakened any sleeping tigers lately? 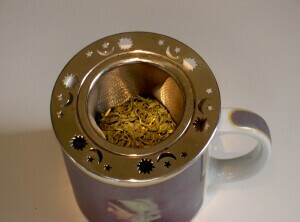 For enjoying delicious loose-leaf green tea by the cup, our favorite strainer is a deep, over-the-cup type widely available on the 'Net (but, unfortunately, not at our website) under the name "celestial tea strainer." The name comes from the sun-and-moon cut-out design in the rim of the strainer, as you can see in the photos below. The nice thing about this strainer is that, unlike most over-the-cup strainer, it's nice and deep, so the tea leaves have plenty of room to swirl around and release their infusion as they brew. And they're a little neater to clean up after than a tea ball. It's nice to have a small cup to set the strainer in between uses. 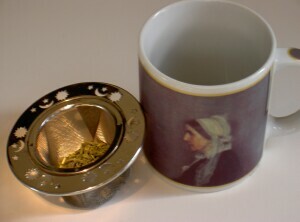 With one of these, a cup, and a means for boiling water, it's easy to enjoy loose-leaf tea by the cup anytime. For brewing at the office, you can heat the water right in the cup in a microwave, or even use an electric kettle. If you’ve ever seen an aerobics show on TV, you’ve undoubtedly noticed that the fast-food companies advertise heavily during these shows. What advertisers seem to be targeting so mercilessly is our tendency to want to “reward” ourselves after doing something that's good for us. In other words, those advertisers are in effect saying, "Go ahead. Have a cheeseburger and a shake. You're exercising, so you deserve it!" This is the same psychology behind golf’s so-called 19th hole: An afternoon spent whacking and following around a small, white ball outside in the fresh air should be rewarded afterwards, the logic must go, with a few cocktails. We all need a little break now and then, but perhaps we should resist the temptation to reward ourselves after every single good thing. How about after every other good thing? After being bombarded for so long by so-called reality shows, shamelessly passed off as real despite their scripted stories and amateur actors pretending to be ordinary folks, the Olympics are refreshingly honest and real. The competition is real -- no one has scripted the outcome in consultation with a marketing department. And the athletes are all real people, doing their best, shouting sincerely for joy upon winning and shedding real tears upon losing. When interviewed before or after an event, they speak from the heart and off the cuff. But the Olympics are not just the ultimate reality show. The holding of the Games amidst today's war, violence, and atmosphere of general mistrust that exists among nations today reminds us why the first Olympic games over 2,000 years ago were such a significant landmark in humankind's history: it was the first time that so many nations came together not to kill each other or scheme against another nation, but rather to compete in friendship and celebrate their common hopes. That is the true significance of the Games. Ichiro Suzuki, the Japan-born Seattle Mariners powerhouse known among baseball fans simply as "Ichiro," is obviously his parents' eldest son. We know this without having to verify it. Not because of lines on his palm or some sort of aura around him, but because of his name, which literally means "first boy." When they named him, Ichiro's parents were following a very old custom that is still followed today, although was much more common, say, a hundred years ago. Then, the average couple had 4 to 6 children, and there were lots of Ichiro's, Jiro's (second son), and Saburo's (third son). Interestingly, a similar custom apparently exists in the Spanish-speaking world, where first-born sons sometimes receive the first or middle name of "Primero" (first), and sons born next are sometimes named "Segundo" (second). We wonder if similar customs exists in other cultures, as well. As an astute reader recently pointed out, I was wrong about this one. (Hey, everyone is allowed one mistake per lifetime, right?) Actually, I had posted a correction, but I should have also posted a correction to this, the original post. What can I say. I was young and not well versed in the ways of the blogosphere then. —Monk, April 28, 2008. How many things do you have on your long-term "to do" list? How long have they been there? How often do you think to yourself, "If I only had the time, I'd ..." Well, look: If you're stressing about work, or school, or family, then every once in a while you have to make the time for yourself and do that thing on your to-do list. Take the day off from work. Just one day! The company won't grind to a halt without you. Or play hookey from school, whether it's high school, college, or graduate school. Come on, you can make up for one missed day. Do whatever it is you've been putting off. Zone out in front of the TV and watch your two favorite movies (with time for a nap between) while everyone else is at work or school. Go for a long drive in the country, off the beaten path, and stop a few times to admire the view. Or spend the day window-shopping downtown. Spend a few hours at a coffee house (or a tea house!) -- just you, your iPod, and a couple of newspapers or that book you've been meaning to sink your teeth into. Or perhaps there's something longer-term you've been putting off, like going back to school, learning another language, or learning how to build and run your own website. These are all investments in your future. "I couldn't possible find the time now," you may think. But you would be surprised at how you can find the time ... how much free time you can find by stripping away the less important things. Such as watching TV shows that, once you stop watching, you realize you can soon forget. Or following an ongoing news story too intently. You don't have to catch every update! In other words, instead of waiting for the time you need to appear, or trying to finish up a jumble of minor tasks before attempting to start a large one, make the time by doing what you want or what you know is good for you in the long run. Start it, and you will instinctively pare down the flurry around you to the bare essentials of what is most important in your life ... and most important for your well-being. 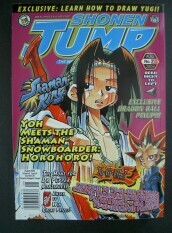 Recently in a local bookstore we came across the English version of "Shonen Jump," Japan's most popular comic book. "Shonen" means "young boy," but the readership of "Shonen Jump" spans both sexes and a wide age range, and it's common to see middle-aged businessmen reading it on subway trains to and from work. this article was written in Time Asia (the Asian version of Time), it was the number-one selling comic in the United States. Like most books in Japan, "Shonen Jump" retains its right-to-left format, i.e., it's binding is on the right-hand side, instead of the left. Why didn't publishers change it for the American market? Because market research showed that American kids think it's cool! Here are a couple of photos from a recent issue, to give you a feel for the artwork, etc. A recent addition to the MellowMonk.com website is info on the easy way to make iced green tea from loose-leaf tea like our tamaryokucha green tea. If you've never made iced tea or iced coffee (which is popular Down South and in other hot places), you'd be surprised at how quickly the ice chills the piping-hot tea; it takes less than a minute after pouring before you have an ice-cold cup of green tea. Tip: Brew the tea a little on the strong side, to allow for dilution by the melting ice. And be sure to use plenty of ice, as we show on our website. Intuitively, you may think more ice would cause the tea to be watered down more, but it's actually the other way around: If you use enough ice, then the hot tea will be cooled so quickly that less ice will melt in the beginning. Iced green tea—a healthy way to "chill out" on a hot day! One of the joys that the Japanese have given the world are instant noodles. Most folks in a certain age range remember when Top Raman first came out and swept America, bringing the taste of Asian noodles to any kitchen or office in a convenient, affordable form. In the home market of Japan, the subsequent years saw intense competition unfold among the big food companies competing for the Japanese consumers' instant-noodle budget. Today, it has gotten to the point where some instant-noodle products are approaching restaurant quality (and restaurant price). 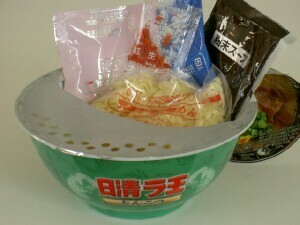 The photo below shows "Nisshin Rao," made by food giant Nisshin and bought here in the U.S. at a Japanese grocery store. (The name "Rao" means "Ramen King.") This baby is the Cadillac of instant noodles. Instead of freeze-dried noodles, these are sealed in a semi-moist state in an individual pouch. In fact, the two types of soup (one powder, one liquid), seasoning (including real green onion), soy sauce, and red ginger are all in their own separate packets. Note the crescent-shaped foil that covers about 1/3 of the bowl. That's a strainer for draining out the hot water that you add in the beginning to loosen the noodles before pouring in "fresh" hot water and then adding the soup and seasoning mixes. In addition, when you are going through this complicated process to prepare instant noodles, suddenly you don't feel like you're preparing instant noodles; you feel as if you are ... cooking! Of course, we at Mellow Monk believe in, ahem, healthy eating, but every once in a while you have to indulge, no? Here are photos of one of Mellow Monk's growers harvesting this year's crop of tea. Our friends at the Nagata chaen (tea farm), located in Aso, Japan, took these and sent them to us on a CD-ROM along with our most recent green tea shipment. As you can see, tea growers in today's Japan don't pick the tea by hand—not unless they're growing ultra-premium tea that would cost an arm and a leg. Besides, hand-picking doesn't enhance the flavor anyway. In Japan, hand-picking is a marketing ploy; in a low-wage country, it's because human labor is cheaper than using machines. What makes a good green tea are the right climate and soil, a good-quality variety of tea plant, proper care during the growing season and the dormant season, how promptly after harvest the tea is processed (the longer it sits around, the more oxidation occurs), how the tea is processed, and how the tea is stored before being shipped out. For instance, at the Nagata Chaen, the Nagata family harvests on a given day only as much as they can process at the end of the day, so that none of the "raw" tea leaves sit in storage overnight. That's what assures a fresh, earthy taste in the tea, and what protects the disease-fighting antioxidants from oxidation, which begins as soon as the leaves are picked. We'll talk about the other tea-quality factors over the coming days. Stay tuned! perfect health pyramid. We believe that a significant part of the health benefit of green tea, especially loose-leaf green tea, is the relaxation that comes with taking a short break from your hectic day to prepare the tea. When the time comes to drink the tea you've prepared, this benefit is multiplied if you can turn away from your computer monitor or whatever you're doing, and stop and savor the tea. That is the Mellow Monk philosophy! This article, from Australia's Sunday Telegraph, offers these relatively painless ways to lose weight ... including drinking green tea. The author cites a Swiss study that "found that green tea has thermogenic properties and promotes fat oxidation." We at MellowMonk.com never cease to be amazed at how something as simple as green tea can contain so many compounds with health-promoting effects. Here's an article on a study showing that green tea can lower blood pressure. Findings about the many health benefits of drinking green tea are announced almost every day, it seems. As medical science continues to advance, who knows what other amazing benefits of drinking green tea will come to light.